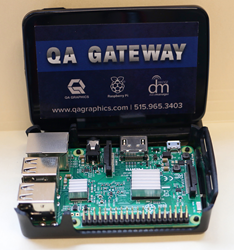 QA Graphics' QA Gateway that partners with their Energy Efficiency Education Dashboards®, is now built with Raspberry Pi technology that uses DSA’s open source IoT platform and data managing software. QA Graphics, a leader in the building automation system (BAS) graphic outsourcing industry, is excited to announce the implementation of a new and dynamic communication technology in their QA Gateway Device. Their QA Gateway that partners with their Energy Efficiency Education Dashboards®, is now built with Raspberry Pi technology that uses DSA’s open source IoT platform and data managing software.